Following on the release and open-sourcing of the first-ever Group Environmental Profit and Loss Account (E P&L) 1 in May 2015, Kering has released the results of its consolidated 2014 Group E P&L today. Kering is continuing to integrate its E P&L results into decision-making and across its business activities to understand how and where the business can better address environmental issues such as climate change. The Kering E P&L is a tool to measure and value the impacts on the environment resulting from the business activities across the entire supply chain and its resulting cost to society. The metrics analysed are the impacts linked to Kering’s operations (retail, offices and transport) as well as those of its supply chains, from raw materials through to manufacturing, and include Greenhouse Gas (GHG) emissions, water use, water and air pollution, waste production and land use changes. Kering was the first Group to implement and disclose the results of its environmental footprint in euros with the publication of its 2013 Group E P&L and the open-sourcing of the methodology. By providing year over year results, Kering is continuing to advance the efforts to include natural capital accounting into mainstream corporate reporting. This comparison between 2013 and 2014 results is the first of the annual benchmarks that Kering is committed to doing and demonstrates how fundamental the E P&L is to the Group’s business reporting. It enables the incorporation of environmental impacts into day-to-day business decisions, helping the business build resilient growth in the face of climate change. ∞ Consistency in year-over-year results and footprint profile validates the methodology, showing that the E P&L is working as an effective tool for decision-making. ∞ Continued implementation of the 2013 E P&L findings and execution of the sustainability strategy has shown some positive results in terms of lower-impact raw materials and manufacturing techniques. ∞ The 2014 figures provide a more in-depth analysis of the key drivers behind greenhouse gas (GHG) emissions at each stage of the supply chain, highlighting where and how the Group can work to mitigate climate change. ∞ Cost of carbon applied by the E P&L is several times higher than market value, at €62 euro per tonne of CO2 emitted. ∞ Refined data and automation and visualization tool allows specific strategic review of the business footprint, such as the impacts of different raw materials from different source countries and the impact of different product categories (e.g. leather handbags3 ). ∞ Scope of the E P&L has evolved and now includes the estimations of the environmental impact from the use of precious stones in the business. The full E P&L learnings and results, valued in euros, are outlined in the 2014 Group E P&L report (downloadable here). Kering is continuing to evolve its methodology and open-source its E P&L toolkit to assist in streamlining the implementation of an E P&L analysis annually, and to further promote natural capital accounting more broadly. As such, Kering will open-source its key multipliers in 2016 to help companies calculate their environmental footprint and its relative valuations. 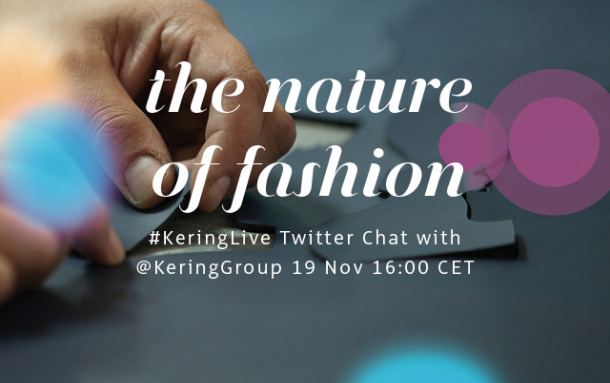 Following the release of these 2014 Group E P&L results, and on the eve of COP21, Kering is hosting a Twitter chat this Thursday, 19 November at 16:00 CET. To join live, or to submit questions in advance, please include @KeringGroup and #KeringLive in your tweet. 1 An Environmental Profit and Loss account (E P&L) analyses the total environmental impacts in a company's own operations, and across its entire supply chain and then estimates the cost to society of the changes in the environment resulting from these activities. 3 Leather bag case study highlighted in the 2014 E P&L report.